The biggest global health conference on any health issue is being held next week. The International AIDS Conference is being held in Amsterdam from July 23rd-27th, the Conference provides a unique forum for the intersection of science, advocacy, and human rights. This year’s theme of AIDS 2018 is “Breaking Barriers, Building Bridges”, drawing attention to the need of rights-based approaches to more effectively reach key populations. 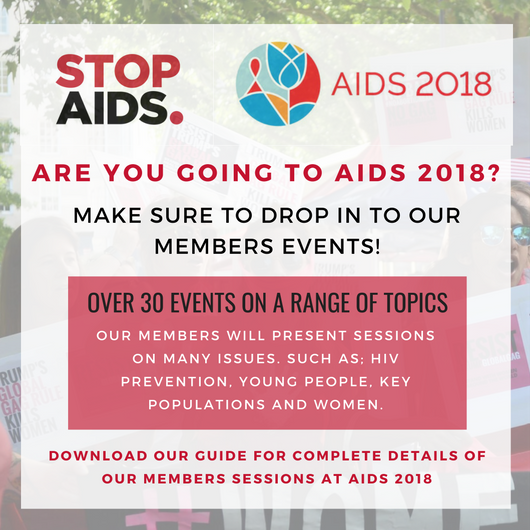 Many of STOPAIDS members will be attending the conference and holding sessions and events. We have put together a guide to our members sessions throughout the pre-conferences and main conference. You can download our complete guide to our members sessions below.